The U.S. Food & Drug Administration has recently approved a digital pill (‘Abilify MyCite’). 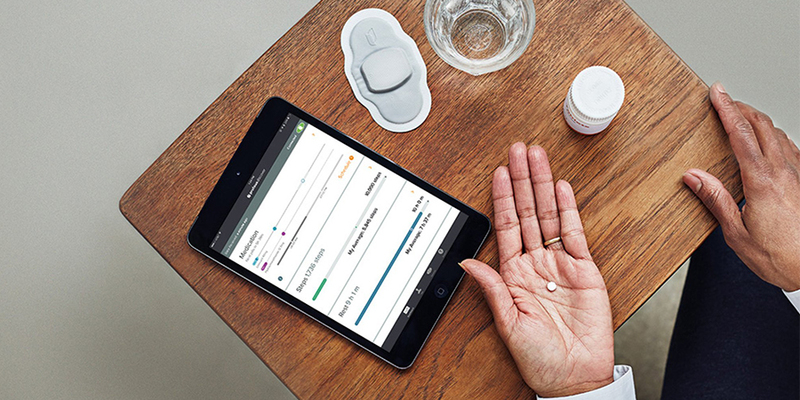 The sensor-enabled tablet sends a notification to the mobile app that it has been taken by the patient. The system was developed to track ingestion of medications prescribed for patients with mental illness. It is quite conceivable that the invention could be applied in further therapeutic areas in the future, e.g. for patients suffering from diabetes or heart conditions. As soon as the pill reaches the stomach, the sensor sends a signal to a wearable patch. The patch transmits the information to a mobile app on the smartphone. Consumed with food, the pill is digested and excreted. Patients can give their consent to information access by their caregivers and doctors using a web-based portal. However, the digital pill is not approved for treatment of patients with dementia-related psychosis. From the medical perspective, a pill that informs whether the prescribed medicines have been taken on schedule is absolutely reasonable. It should be noticed, that the sensor records only the swallowing of the pill. There is no feedback in case the patient didn’t take it. Neither doctor nor patient will be alerted. However, the pill provides an indirect control function. So what is about privacy issues? There are real concerns about data security. Some experts are worried that tracking pills will be a step towards punishing patients who don’t comply. Moreover, critics point out it should be made sure that unauthorized access to the transmitted data is excluded. Besides, there are more specific questions. Is it conceivable that in the future health insurance companies will gain access to the data sent by the digital pill to use it for refusal of costs coverage? The technology is just a foretaste of the future healthcare. What can we expect? It will be dominated by sensors analyzing a different kind of data. Digital measuring of the human body will be very likely followed by AI-based digital diagnostics that will essentially change our understanding of health. Concurrently, patient treatment will be also influenced by new digital technologies. The medicine of the future is expected to be data-based and, thus, highly personalized. But that is not all. Ray Kurzweil, the famous U.S. author, computer scientist, inventor, and futurist is forecasting that by 2030 humans will have cell-sized nanobots in brains connecting us to the Internet. We will be able to simply download skills like in ‘The MATRIX’. He noticed that our thinking will be a hybrid of biological and non-biological thinking. Moreover, he predicts that our genes will be edited in order to cure diseases. Kurzweil is well-known for his predictions. For example, he made 147 prognoses for 2009 in the ‘90s. In fact, 86 percent of them were right.